What is the 20% QBI Deduction? In late 2017 with the passage of the Tax Cuts and Jobs Act (TCJA), a new 20% deduction for pass through businesses was created. This deduction is also known as the section 199A deduction, the deduction for qualified business income (QBI), the 20% deduction and the pass-through deduction. In this post, we’ll discuss who can take the deduction, how it is calculated and provide some examples to aid in ones understanding. So as you can see, the deduction is intended for those entities that are not classified as C-Corporations. Why? We’ll since the TCJA cut the corporate income tax rate to a flat 21%, this was the way to replicate a similar treatment for those entities that were not structured as such. What is QBI? QBI is the net amount of qualified income, gain, deduction and loss from any qualified trade or business. Only items included in taxable income are counted. In addition, the items must be effectively connected with a U.S. trade or business. Items such as capital gains and losses, certain dividends and interest income are excluded. One that is defined as a specified service trade or business (SSTB), which includes those that involve the performance of services in the fields of health, law, accounting, actuarial science, performing arts, consulting, athletics, financial services, investing and investment management, trading, dealing in certain assets or any trade or business where the principal asset is the reputation or skill of one or more of its employees. Whether the business is an SSTB. Whether there is more than one trade or business. QBI for each trade or business. W-2 wages and UBIA of qualified property. How is the deduction for QBI calculated? Now this is where things “can” get complicated. In the simplest application, the deduction is equal to 20% of domestic QBI from a qualified trade or business. The deduction is taken on an individuals personal return and “below the line.” Thus, it reduces taxable income and not adjusted gross income (AGI). 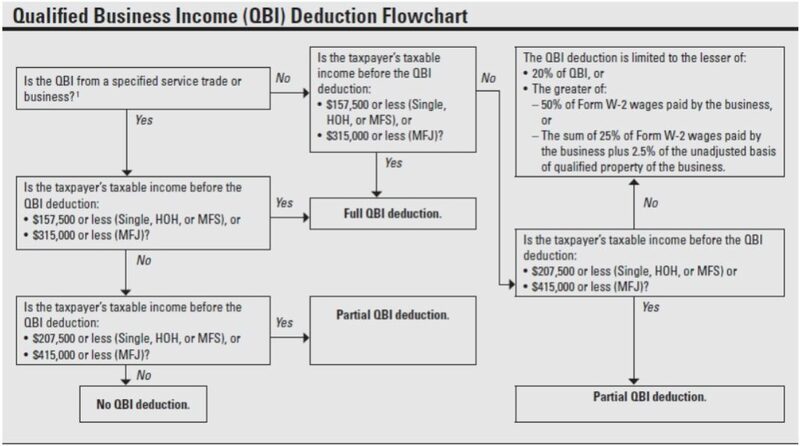 The following 199A Calculator will give you a quick idea of how it works and what a QBI deduction might look like for your situation. 20% percent of the taxpayer’s taxable income minus net capital gains. So basically, the deduction will never be greater than 20% of the taxpayers QBI or their taxable income. Now what happens if the income is above the amounts specified above? An amount equal to the reduction ratio multiplied by the excess amount. The limitation does not apply to any taxpayer whose taxable income is below the $315,000/$157,500 threshold amounts. If the taxpayer’s taxable income exceeds the phase-in range (i.e. greater than $415,000 for joint filers and $207,500 for all other filing statuses), no deduction is allowed with respect to any SSTB. I am a visual person. Do you have a flowchat to illustrate what all of the above means? Ask and you shall receive. Take a look at the graphic below (absent some of the calculations). Calculation examples using various ranges and business types. On August 8, 2018, the IRS released proposed regulations on §199A, providing guidance on their interpretation of provisions regarding the new 20% deduction for pass-through entities. The proposed regulations span 184 pages and provide numerous definitions, examples, and anti-abuse provisions. As such, it’s a good idea to review the examples in the link (see page 114/184) as the IRS has outlined computations for many scenarios. The examples shown below are designed to help you gain a general understanding of how the information presented above comes into play. Example 1 In 2018, Pilar, an unmarried individual, operated an accounting and tax business (a SSTB) as a sole proprietor and earned a net Schedule C income of $100,000. She did not have any capital gains or losses. She claimed the standard deduction of $12,000 so her taxable income was equal to $88,000. Pilar’s QBI deduction is $17,600, the lesser of 20% of her QBI ($100,000 x 20% = $20,000) or her taxable income minus long-term capital gain ($88,000 x 20% = $17,600). Because she is in the lowest range, the fact that she operates SSTB is irrelevant. Example 2 Assume the same facts as above except that Pilar had $7,000 in long term capital gains. Pilar’s QBI deduction is $16,200, the lesser of 20% of her QBI ($100,000 x 20% = $20,000) or her taxable income minus long-term capital gain ($88,000 – 7,000 = $81,000 x 20% = $16,200). Example 3 Popeye and Olive Oyl are married and file a joint individual income tax return. Popeye earned $300,000 in wages as an employee for the Department of Defense in 2018. Olive Oyl owns 100% of the shares of Alessi, an S corporation that manufactures olive oil. Alessi generated $100,000 in net income from operations in 2018. Alessi paid Olive Oyl $150,000 in wages in 2018. Neither Popeye or Olive Oyl have any capital gains or losses. After allowable deductions not related to Alessi (i.e. personal itemized deductions) , Popeye and Olive Oyl’s total taxable income for 2018 is $300,000. item of deduction for purposes of determining Alessi’s QBI. The QBI deduction with respect to Alessi’s QBI is then determined by Olive Oyl, Alessi’s sole shareholder, and is claimed on the joint return filed by Popeye and Olive Oyl. Their QBI deduction is equal to $20,000, the lesser of 20% of Olive Oyl’s QBI from the business ($100,000 x 20% = $20,000) or 20% of Popeye and Olive Oyl’s total taxable income for the year ($300,000 x 20% = $60,000). These limitations are phased in for joint filers with taxable income between $315,000 and $415,000, and all other taxpayers with taxable income between $157,500 and $207,500. purposes that conducts a single trade or business (freight operations). Public Enemy holds no qualified property. Bonnie’s share of Public Enemy’s QBI is $300,000 in 2018. Bonnie’s share of the W-2 wages from Public Enemy in 2018 is $40,000. Clyde earns wage income from employment by an unrelated company. After allowable deductions unrelated to Public Enemy, Bonnie and Clyde’s taxable income for 2018 is $375,000. Bonnie and Clyde are within the phase-in range because their taxable income exceeds the applicable threshold amount, $315,000, but does not exceed the threshold, or $415,000. Consequently, the QBI component of Bonnie and Clyde’s QBI deduction may be limited by the W-2 wage and UBIA limitations but the limitations will be phased in. 20% of Bonnie’s share of Public Enemy’s QBI. This amount equals $60,000 ($300,000 x 20%). Next, Bonnie and Clyde must determine 50% of Bonnie’s share of Public Enemy ’s W-2 wages. This amount is $20,000 ($40,000 x 50%). Because 50% of Bonnie’s share of Public Enemy’s W-2 wages ($20,000) is less than 20% of her share of Public Enemy’s QBI ($60,000), Bonnie and Clyde must determine the QBI component of deduction by reducing 20% of Bonnie’s share of Public Enemy’s QBI by the reduction amount. Bonnie and Clyde are 60% through the phase-in range (that is, their taxable income of $375,000 exceeds the threshold amount by $60,000 and their phase-in range is $100,000). Bonnie and Clyde must determine the excess amount, which is the excess of 20% of Bonnie’s share of Public Enemy’s QBI, or $60,000, over 50% of Bonnie’s share of Public Enemy’s W-2 wages, or $20,000. Thus, the excess amount is $40,000. The reduction amount is equal to 60% of the excess amount, or $24,000 ($40,000 x 60%). Thus, the QBI component of Bonnie and Clyde’s deduction is equal to $36,000, 20% of Bonnie’s $300,000 share Public Enemy’s QBI (that is, $60,000), reduced by $24,000. Bonnie and Clyde’s QBI deduction is equal to the lesser of (i) 20% of the QBI from the business as limited ($36,000) or (ii) 20% of Bonnie and Clyde’s taxable income ($375,000 x 20% = $75,000). Therefore, Bonnie and Clyde’s deduction is $36,000 for 2018. Example 5 Assume the same facts as in Example 4, except that Public Enemy was engaged in a SSTB (consulting). Because Bonnie and Clyde are within the phase-in range, Bonnie must reduce the QBI and W-2 wages allocable to Bonnie from Public Enemy to the applicable percentage of those items as a proportion to the phase out range. Furthermore, she must apply a reduction amount to the calculation. The applicable percentage equals 100% minus the percentage obtained by dividing (a) the pre-QBI deduction taxable income of the taxpayer in excess of the applicable threshold amount by (b) $100,000 for joint-return filers or $50,000 for other filers. Reduction amount means, the excess amount multiplied by the applicable percentage. It is calculated as 20 percent of QBI over the greater of 50 percent of W-2 wages or the sum of 25 percent of W-2 wages plus 2.5 percent of the UBIA of qualified property. For Bonnie and Clyde’s applicable percentage, their taxable income ($375,000) exceeds their threshold amount ($315,000) by $60,000. A ratio of 60% (i.e. $60,000/$100,000) is what is used to find their applicable percentage of 40% (i.e. 100% – 60% = 40%). Accordingly, in computing the QBI deduction, the couple would only be allowed to take into account 40% of the QBI, W-2 wages, and qualified property with respect to the trade or business. (ii) the greater of the W-2 wage or UBIA of qualified property limitations. Twenty percent of Bonnie’s share of QBI of $120,000 is $24,000. The W-2 wage limitation equals 50% of Bonnie’s share of Public Enemy’s wages ($16,000 x 50%) or $8,000. To calculate the reduction amount Bonnie and Clyde must first determine the excess amount. This is calculated as the excess of 20% of Bonnie’s share of Public Enemy’s QBI, as adjusted ($24,000), over 50% of Bonnie’s share of Public Enemy’s W-2 wages, as adjusted ($8,000). Thus, the excess amount is $16,000. The reduction amount is equal to 60% of the excess amount or $9,600. Thus, the QBI component of Bonnie and Clyde’s QBI deduction is equal to $14,400 ($24,000 – $9,600). As Bonnie and Clyde’s QBI deduction is equal to the lesser of (i) 20% of the QBI from the business as limited ($14,400) or 20% of Bonnie’s and Clyde’s taxable income ($375,000 x 20% = $75,000), their QBI deduction is $14,400 for 2018. Example 6 Ernie, an unmarried individual, is a 30% owner of Bert LLC, which is classified as a partnership for Federal income tax purposes. In 2018, Bert LLC has a single trade or business (landscaping) and reported QBI of $3,000,000. Bert LLC paid total W-2 wages of $1,000,000, and its total UBIA of qualified property is $100,000. Ernie is allocated 30% of all items of the partnership. For the 2018 taxable year, Ernie reports $900,000 of QBI ($3,000,000 x 30%) from Bert LLC . After allowable deductions unrelated to Bert LLC (i.e. personal itemized deductions), Ernie’s taxable income is $880,000. Twenty percent of Ernie’s share of QBI of $900,000 is $180,000. The W-2 wage limitation equals 50% of Ernie’s share of Bert LLC’s wages ($1,000,000 x 30% = $300,000 x 50%) or $150,000. (ii) 2.5% of Ernie’s share of UBIA of qualified property ($100,000 x 30% = $30,000 x 2.5%) or $750. For items 2 and 3 above, the greater of the limitation amounts ($150,000 and $75,750) is $150,000. The QBI component of Ernie’s QBI deduction is thus limited to $150,000, the lesser of (i) 20% of QBI ($180,000) and (ii) the greater of the limitations amounts ($150,000). Ernie’s QBI deduction is equal to the lesser of (i) 20% of the QBI from the business as limited ($150,000) or (ii) 20% of Ernie’s taxable income ($880,000 x 20% = $176,000). Therefore, Ernie’s QBI deduction is $150,000 for 2018. Ready to get help? As you can tell, the computations involved in taking the deduction get more complicated depending on the taxpayers income. If you don’t want to go through the mechanics of calculating your QBID and ensuring it is correct, why not let a professional do the work? Feel free to give us a call or drop us an email and we’d be happy to assist you ensure that everything is done correctly. Plus, you won’t have to spend the time doing it! This entry was posted in Tax Talk and tagged 20 pass through deduction explained, 20% pass through deduction calculator, How does the new IRS Qualified Business Income deduction work?, IRS §199A deduction, IRS pass through deduction, IRS REG-107892-18, QBI calculator, QBI deduction calculator, QBI deduction examples, QBI deduction explained, QBI deduction flowchart, QBI deduction limitation, QBI deduction phase out, QBI deduction service business, QBID, QBID examples, qualified business income deduction, Section 199A deduction calculator, specified service trade or business SSTB, what does QBI stand for, What is QBI, what is the 20 deduction for pass through, what is the pass through deduction, What is the QBI Deduction on December 23, 2018 by Jared R. Rogers, CPA.